#488 - GUEST: The Moustache Epic part 1 of 2 by Jonathon! Submitted by Japanese-Cowboy on November 29, 2010 - 9:05am. Jonathon is awesome! And this comic will hopefully explain why I also drew him with a crazy handlebar mustache in my guest comic! Submitted by miasaki666 on November 29, 2010 - 3:35pm. Submitted by jdalton on November 29, 2010 - 7:09pm. Submitted by bk-o on December 1, 2010 - 12:08am. Just saying: if anyone wants ta go to the link'd website, add "www." before "jonathondalton.com"... just sayin'. Jonathon Dalton, as you might have noticed, is the only other comicker that I know well who is crazy enough to colour their webcomic in marker. Markers4life! 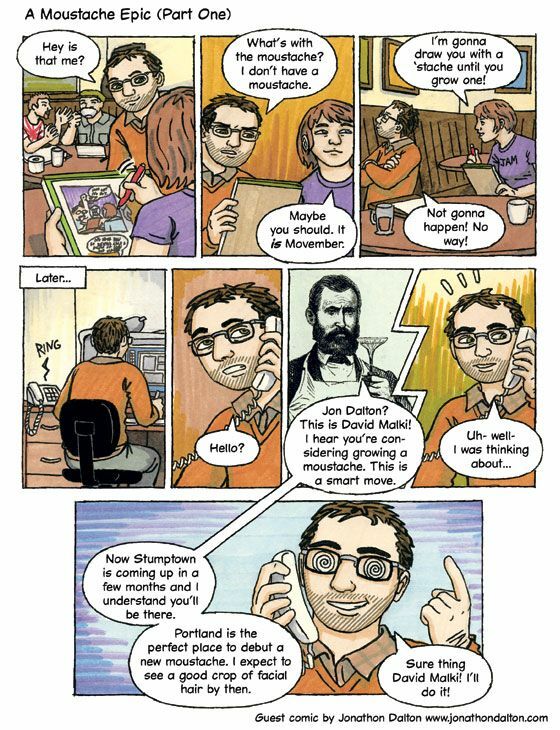 This true story comic also features Malki!